The Most Important Topics to Include in an Employee Handbook - World Wide Specialty Programs Inc. While 22 million small businesses in the United States operate as individuals, the other six million in the country have a set of employees that help them run their day-to-day operations. If a business has employees, it’s a given to have an employee handbook for those that are in the onboarding process. The employee handbook is the holy grail of every work document that you should know about while working for a particular company. A necessity across the board, a good company will always have an employee handbook that covers the most important topics to help run a business successfully. When employee roles are clearly written and explained to employees in detail, it also means that employers are keeping themselves safe from future potential lawsuits. On top of covering an employer from litigation, an employee handbook also helps put employees at ease while on the job. If you’re wondering what the most important topics to include in an employee handbook are, here’s a list below, via GenesisHR Solutions. Putting a notice and disclaimer up front means that the employee handbook is always subject to change. It also acknowledges that the handbook doesn’t signify permanent employment. Always put this at the front of a handbook so it’s seen immediately and signed as soon as possible. It’s also important to include an employee at-will policy, which is required in most states across the country (but not all). This policy means that employees and their employers can separate at any given time. It’s imperative to show that your business takes a stand against harassment and discrimination of any kind. When you promote a positive workplace, many are going to look for these types of statements to protect them at their job. Having these types of statements in a handbook shows that your business means business. Anti-harassment is also going to include workplace violence and workplace safety. Every employee has to be able to legally work in the states. That’s where work authorization comes into play. If an employee doesn’t have permission to work here, the results could be disastrous for a company. The next thing to do is to ensure that every employee knows the differences that come with employee classification. Not everyone is the same: some are part-time, some are interns and some are full-time. People are going to ask about these things, so including them in your handbook is essential for to promote a positive, healthy workplace. Always clarify overtime pay and how much time off an employee can receive through your company. When company employees act out of line while representing their employer, having a code of conduct and a conflict of interest policy in place can help prevent a costly lawsuit. 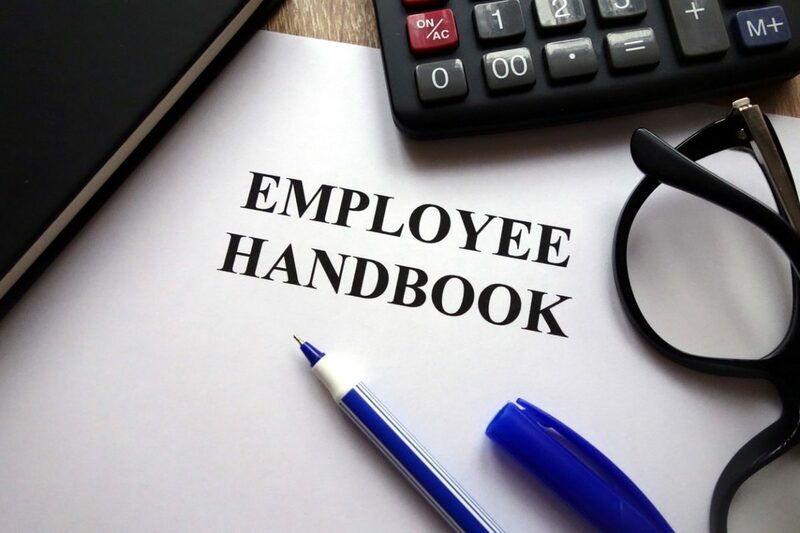 Other topics to include in an employee handbook include unemployment compensation, payroll deductions, direct deposit, holidays and other time off; along with health and welfare benefits and staffing insurance. blog, Staffing Agency, Staffing Insurance Employee Handbook, Employee Handbook Guidelines, Employee Handbook Topics, Staffing Insurance permalink.